Zdrada photosPinkerton 182-pounder Sterling McLaughlin grabs an ankle during his 182-pound semifinal victory at the Meet of Champions Saturday. He later prevailed in the finals for his second straight MOC title. Junior Sterling McLaughlin (38-2) became a two-time champion at 182, winning 9-4 in the finals, to pace the Astros while freshman Jack MacKiernan was runner-up at 160, Robbie Fahey was second at 220 and Tyler MacKiernan survived a 4-3 decision in the 152-pound consolation finals for third. Their efforts helped the Astros take fourth as a team with 134.5 points. They all advance to this weekend’s New England championship. Powerhouse Timberlane won the meet with 244.5 points, well ahead of Concord (143) and Salem (136). 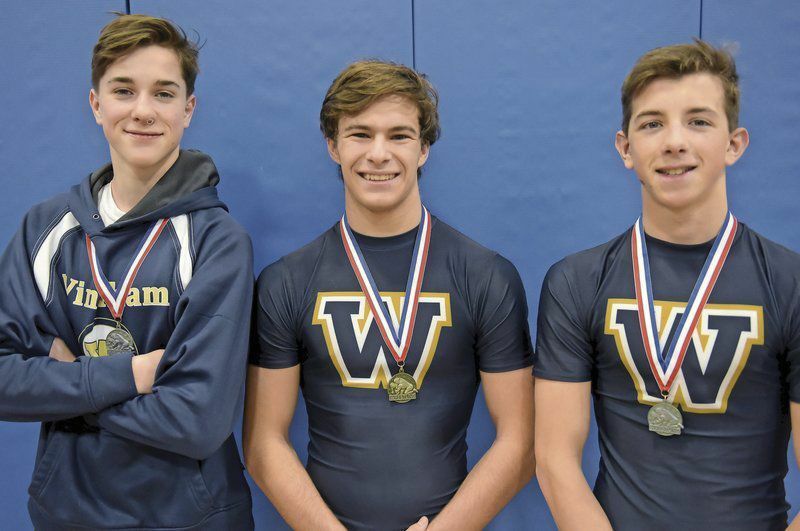 Windham had two qualifiers in 120-pounder Payton Sills and 138-pounder Riley Millette, both of whom finished third. Sills defeated freshman Skylar Hattendorf in overtime, 8-6, in the consolation finals. Despite losing, Hattendorf became the first girl to ever place at the Meet of Champions. Millette became a four-time New England qualifier when he turned an 8-5 deficit into a third period pin. Millette received a well deserved honor when he was awarded the Gavriel-DeCenzo award given by the wrestling officials. It is awarded to the one wrestler they feel is the outstanding example of sportsmanship in the state.